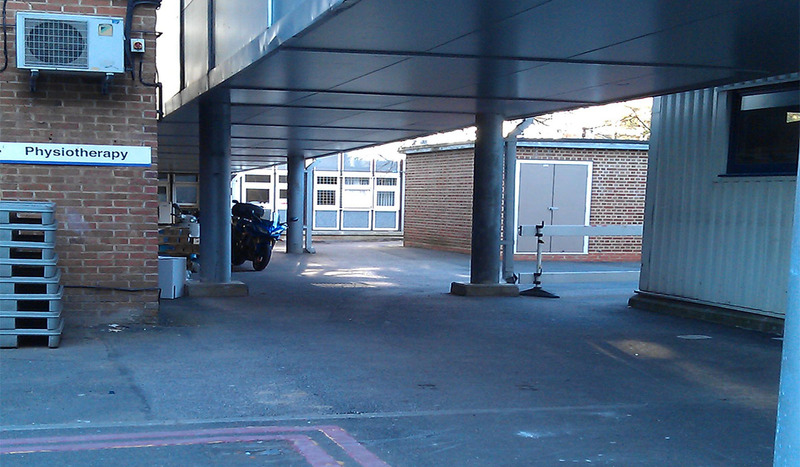 Geo-Environmental Services Limited were commissioned by Angell Thompson & Partners Ltd on behalf of Kingston Hospital NHS Trust to provide information on ground conditions to support the design of piled foundations for a proposed generator and oil tank base at Kingston Hospital. The primary purpose of the investigation was to look at the factors that may impact the design and construction of the foundations for the generator and oil tank base, as well as to identify any contamination in the development area. The possible presence of trees and shrinkable soils was particularly targeted as these could have had a significant impact on the design and construction of the foundations. At the time of the investigation, the areas all around the investigation area where in use and consideration was given to the health and safety of members of the public and hospital staff when planning the works. High utility levels where located in the area, so an appropriate risk assessment and method of cable avoidance where employed. A total of two bulk samples were taken, one from cable percussive borehole, and one from window sampling borehole. The cable percussive borehole was located within the area of the proposed generator, whilst the window sampling boreholes was positioned within the location of the proposed oil tank. The super heavy dynamic probe was positioned adjacent to the window sampling borehole and was employed to provide information on the geotechnical engineering properties of soil. The Atterberg limit test results taken from the soil allowed us to define a preliminary pile design in our letter report, which also included advice on ground contamination levels and waste disposal.